You’re sitting in the office and typing away when the power goes out. You hear the sirens in the distance. At first, everyone is quiet. The manager comes out to say there has been some kind of disaster. Public transportation has been temporarily shut down. There is no power. Every store and restaurant are closed until whatever is going on is over and done with. You walk out to your car, grab you get home bag, and start walking. Who would you rather be: the people stuck in the office overnight or the person unafraid to go home? Keep reading to find out everything you need for your get home bag list. What’s a Get Home Bag? 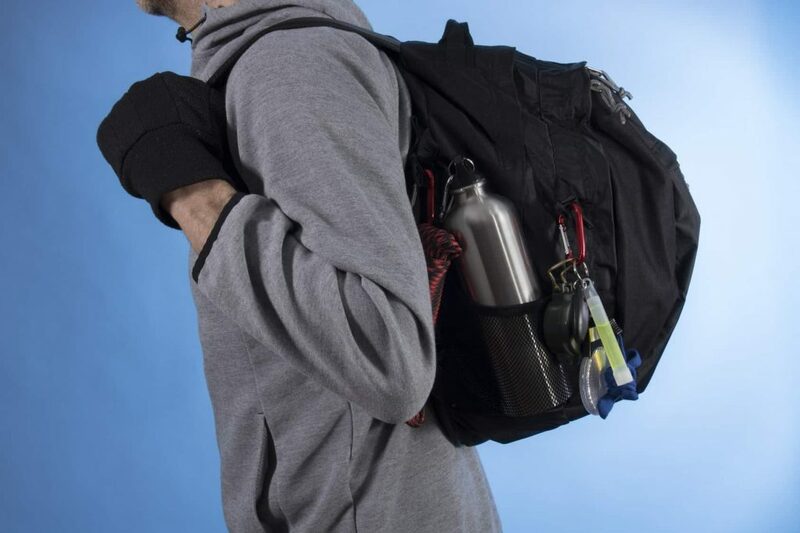 You may be familiar with the term “Bug out bag” as well as the “bug in bag”. They are substantially different. Both of those setups are for about a week either stuck in your home or having no other option but to leave it. The get home bag is for when it’s the only place you want to go. It’s to give you enough supplies to last 1-3 days. Here’s what you need. This is at the top of our get home bag list for a reason. Your backpack should be light, durable, and above all else, waterproof. You’ll want at least a liter of water (preferably in a metal container, in case you need to boil it to make it safe for drinking or cooking). 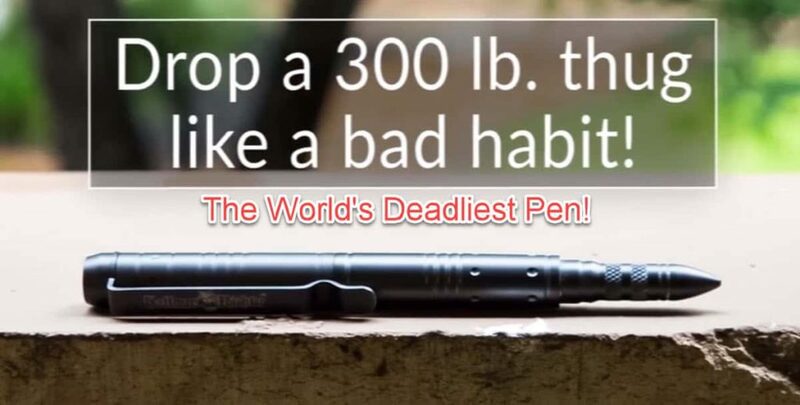 This is the survival tool you need the most. Clean water is the most important thing to have whether you’re in an emergency situation, out on a trail or camping in a remote area where clean water isn’t available to you. Running out of clean water is one of the most dangerous situations you can find yourself in. With a water filter, you can make clean water from the puddles, streams, ponds, or rivers you come across. This safe water will keep you hydrated so you have enough energy to find your way back home and to your loved ones. For food, go with high-calorie snack or protein bars and other foods that are light, easy to eat, and will give you sustainable energy, such as sardines or tuna. Use plastic wear to lighten the load. Push comes to shove, you can make an eating utensil out of pretty much anything. A handgun if you can legally carry it with plenty of ammo. 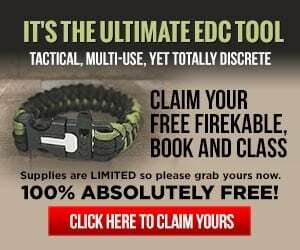 You’ll want an everyday carry (EDC) knife for protection and utility uses such as clearing a jammed round in the chamber, cutting paracord, etc. ), as well as a quality survival knife. Keep it light and simple. 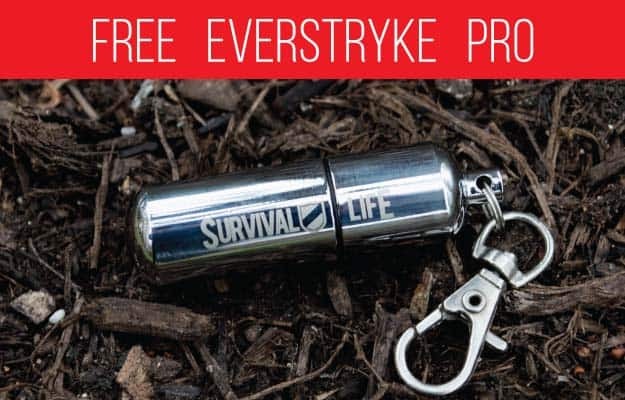 A waterproof survival lighter like the free Everstryke Pro and some weatherproof tinder will be fine Remember, we’re on the fly here. Don’t weigh yourself down. This kind of goes without saying. If you want to be prepared for anything, this should probably be one of your first buys. At the very least, you’ll want a head lamp. They’re light and keep your hands free to work. We all suggest a small and lightweight EDC flashlight (this one’s free). An N95 face mask, an emergency mylar blanket, a lightweight tarp, and at least 100 ft of paracord. A paracord bracelet is fashioned out of small pieces of nylon rope and cord woven together, and each piece can be taken apart and used for necessary survival tasks. For example, if you are running low on food, you can use your paracord bracelet to set up a trap or catch some fish. You can even use some of the loose threads to start a fire so you can cook whatever you catch. 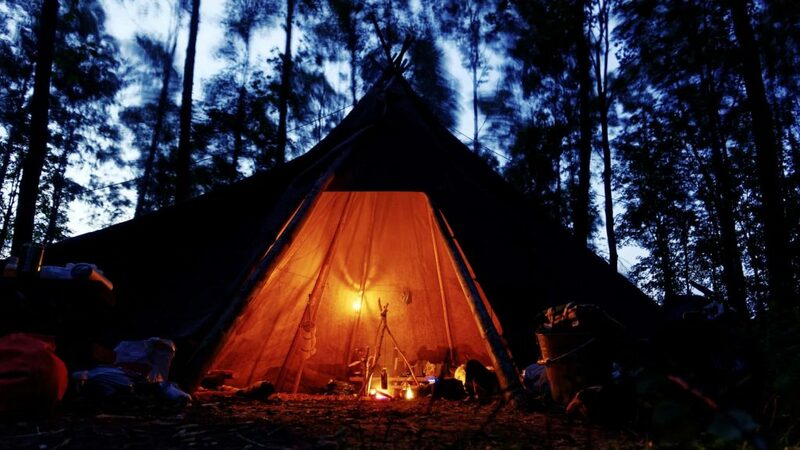 You can also use the ropes and cords to set up a shelter or bear proof your camp by hanging your belongings from a tree. Though it may look like a fashion statement, this bracelet could save your life. A mylar blanket has a lot of uses, and one of the most important uses is keeping you warm at night. Temperatures get cold at night when you’re out camping, and a mylar blanket will keep your body heat from escaping. They can also be used to make emergency shelters. If you need a place to sleep at night, you can make a lean-to with the mylar blanket and some sticks, or if you just need shelter from the sun, you can set up the mylar blanket as a sun blocker. Mylar blankets are helpful because they can be used like multiple different survival tools. 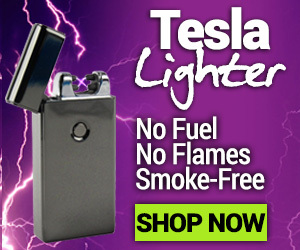 You can use them to cook meat and light up the camp, and they are very easy to carry. Being ready for anything means being ready for everything. Just because there’s a disaster doesn’t mean we can’t stay fresh and clean. Toothbrush and paste, wet naps, bandana. If you want to bring toilet paper and have room for it, by all means. Though they may not seem very important, a change of warm, dry clothes is one of the best survival tools you can pack. If for some reason you get wet, maybe it rains or maybe you have to wade through a river, you do not want to stay in your wet clothes. Wet clothes will make you cold, and your body will have to waste energy to try to keep it warm. You also run the risk of getting hypothermia, which is never something you should chance, especially if you’re on your own. 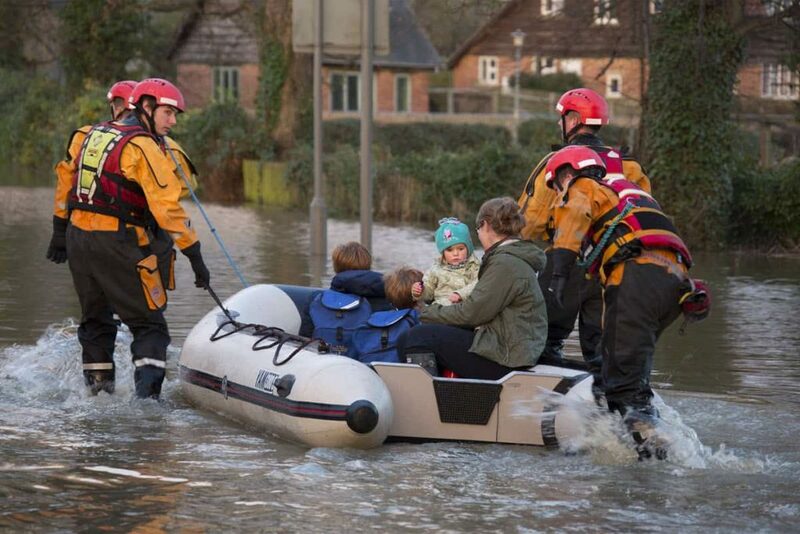 A change of clothes can keep you warm and dry even if getting wet is unavoidable. You never know what the weather is going to be like in a disaster. Be prepared with weather appropriate clothing and footwear. This could be the only way you have of knowing what’s going on around you and how to best avoid it. These products are all light and easy to pack. An emergency radio keeps you informed during an emergency and is a must have piece of equipment in your get home bag. A good emergency radio should be lightweight and should be able to operate from multiple power sources including hand-crank, AA and rechargeable batteries, and even a solar panel. It should also include an AM/FM radio, NOAA Weather scan, an emergency flashlight (that flashed the SOS morse code) and even an ultrasonic dog whistle to help alert the rescue dogs of your location. A good emergency radio will also include a USB plug to use for recharging your other electronic devices such as your cell phone. An old-fashion compass is an essential piece of survival gear because it can always get you back to civilization if you’re lost. Make sure you know how to use your compass before your hike or camping trip. It may sound silly to say, but many people don’t know how to use their compasses, and the compass is only helpful if you can read it. It is also a good idea to map out the area you will be hiking through so you know what’s around you. If you get lost, you can look at your map and figure out how to get back on track. These are the essential items for your get home bag. They pair nicely with the bug out/bug in versions. However, it’s really important to keep them separate. As an example, don’t use one first aid kit for each edition. What did you think of our get home bag list? Let us know in the comments below, and be sure to check out more of our free survival gear while you’re at it.